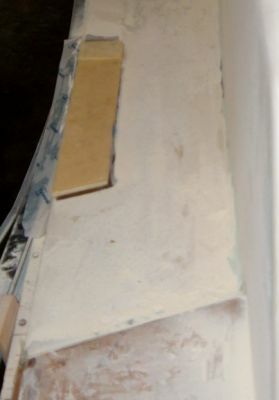 This photo shows 1/2" core-cell epoxied into place to form a 16" extention of the toe rail. This still leaves over 12" of open space. 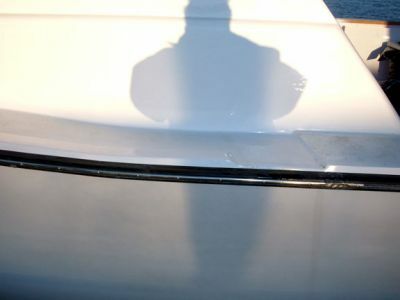 Not only does this consolidate the area of the hull that gets dirty from run-off, it makes walking around the boat safer. Sally has mudded in the new addition of toe rail. She works hard to make what I have done look good. Thanks Sally! Showing off the new toe rail. Now there is only about one foot of area that the water will run off and for a chance of your foot slipping off of the boat. The new gunnel will also help insure a water stop.